If you follow wanderlust ATLANTA's Facebook Page, you know that this past weekend I was on a short, long-weekend vacation in Natchez, Mississippi, and New Orleans...and yes, we drove from Atlanta. Our first stop was Emerald Mound, only 10 miles northeast of Natchez. It's the second largest temple mound in the United States and was constructed by the Mississippians, ancestors of the Natchez Indians, and used between 1250 and 1600 A.D.
Emerald Mound is a National Historic Landmark, managed by the National Park Service, and is open to the public every day free of charge. This mini vacation was with my best friend Barry who minored in geology in college. 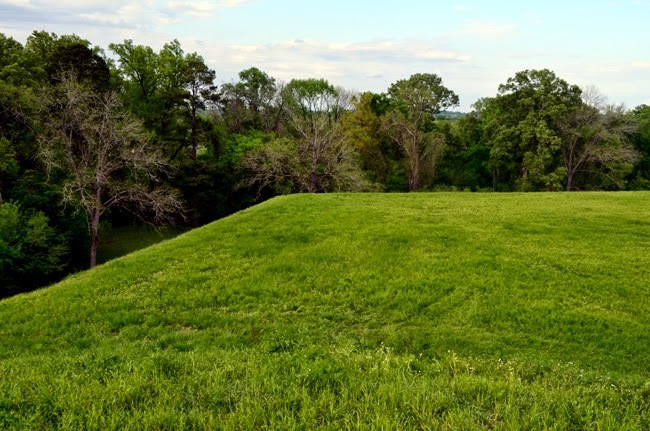 You may remember that my first dream career was to become an archaeologist, so Barry and I share a passion and fascination for archaeology and historic sociology, thus Emerald Mound being the perfect stop before heading on to Natchez. That's Barry at the top of the Mound (photo above) with another friend (background) and vacation host/tour guide, who is from and lives in Mississippi. At only eight (8) acres, Emerald Mound is one of the more modest National Parks I've visited, but it does not lack in fascination. 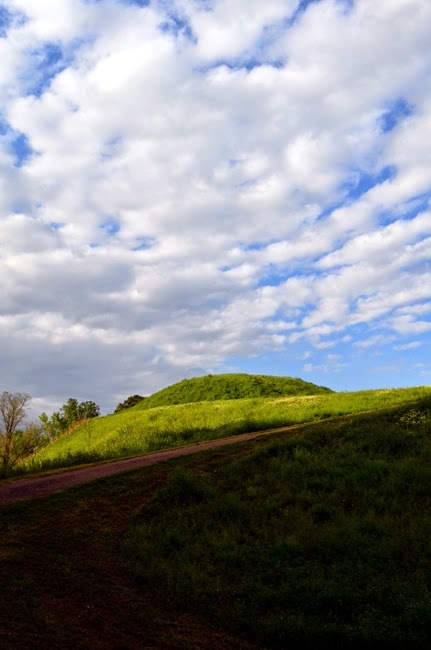 Emerald Mound, unlike many other mounds built only as burial sites, was constructed to support temples, ceremonial structures, ceremonial dances, games, religious rituals, and burials "of a complex society's civic and religious leaders." 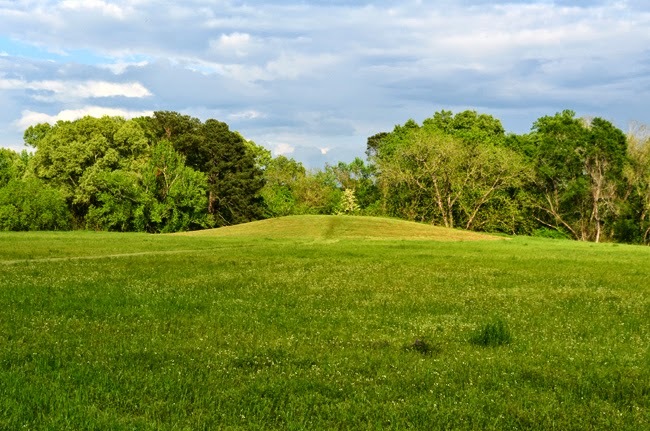 Emerald Mound was constructed by depositing earth along the sides of a natural hill. In a video at the Natchez Visitor Center, they suggest that the Mississippians had a great deal of free time, thus the incentive to build such a structure, but I have to wonder if that's totally accurate. I mean, surely they spent a great deal of time hunting and gathering, let alone creating a home life for their families. But then again, as busy as we are today, we still manage to build magnificent skyscrapers and space faring vehicles. But still, I have to wonder what the true motivation was to build such a remarkable landmark. 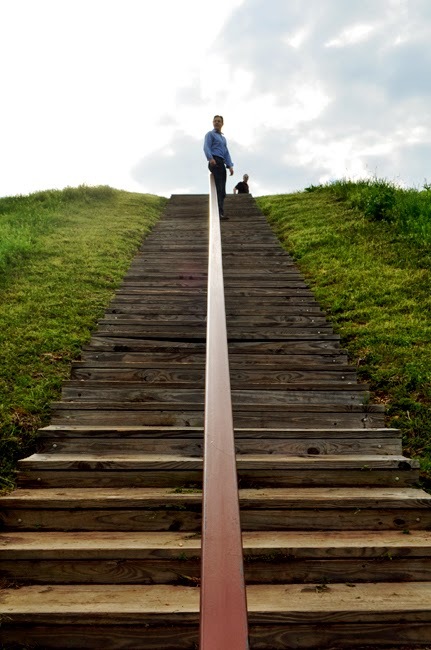 To put the size of Emerald Mound into perspective, it measures 770 by 435 feet at the base and is 35 feet high. Two smaller mounds sit atop the expansive summit platform of the primary mound (the smaller mound pictured above). The larger of the two is 190 by 160 feet and is 30 feet high, making it taller than a six story building! Having ancestors who were Native American, I have more than a passing interest in Indian cultures. And how can one not be fascinated that this culture carried on their backs thousands of tons of earth to create this Mound? If you're traveling to Natchez or the area, I highly recommend a stop at Emerald Mound. Perhaps you'll share my awe of this beautiful and sacred site...or at the very least a profound fascination.